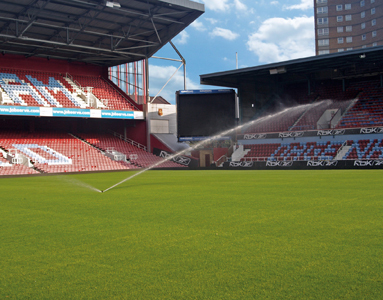 Topturf Irrigation has a combined experience of over 100 years specialising in fully automatic and manually operated irrigation systems for all types of sports surfaces. These include golf courses, football pitches, race courses, cricket squares and outfields, bowling and croquet lawns and any other type of surface that requires measured amounts of water. We work hard to achieve your bespoke requirements and ensure that we deliver a quality installation with the minimum of disturbance and inconvenience to members and guests. Our installation teams are polite, friendly and work hard to ensure your complete satisfaction with the end product. Our team understands the importance of listening to and delivering on your requirements. Site surveys are free of charge and are carried out in a prompt and efficient manner. Designs can include aerial photographs, easy to understand system layout diagrams with clear and transparent cost estimates. On presentation of our quotations we will advise realistic timescales and will detail product quantities and relevant information to you in person.